A few office feng shui tips can help you determine the appropriate changes you need to establish good feng shui where you work. Whether your workspace is a large open office, a confined cubicle or home office, implementing feng shui rules can improve your career, health, wealth and other areas of your life. 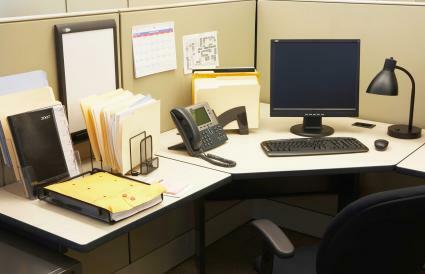 Open cubicle area: Cubicle offices present specific feng shui challenges, such as fixed desk and other furniture pieces and sitting with your back to the cubicle entrance. Feng shui offers cures, such as a mirror to see anyone coming up behind you. Outer offices: Large offices, especially high-rise offices often have a bank of windows along the outside wall. While it may be tempting to sit with your back to the windows, you will lack the support you need in your work. Place your desk so you have a solid wall behind you. Use a feng shui office layout for auspicious chi energy and success in your career. Office conference room tips: The focus of a conference room is the table. Select an oval or round table to encourage auspicious chi energy to move about the room. Oftentimes people focus the office and workspaces and ignore or neglect the storage and service areas. You want to apply the same feng shui rules and principles to these utility type of rooms and spaces. Storage areas: The main feng shui office tips for storage areas is organization. Avoid cluttering these areas by providing adequate file storage, bins for inventory items and janitorial supplies. Server areas: Whether it is a clean room environment or a simple server storage, you want to implement feng shui principles of organization and clutter free. Break room: Office feng shui tips include the break room. This should be a clean environment with restive colors and an unblocked entrance/exit area. Provide plenty of trash bins and educate employees to adhere to good housekeeping practices. If you a reception area, you want this space to be inviting. The reception area should instill confidence and calmness in your clients. Provide updated magazines and replace worn or tattered ones. Tidy up during the day if necessary. If you don't have a reception area and clients enter directly into your office or your office is located within a large corporation, you can still create an inviting entrance into your office with plants and lights. Color plays an important part. Don't limit yourself to certain colors matching feng shui directions. A color cannot activate chi energy. If you prefer to use colors based on direction you can, but it certainly won't hurt the feng shui of your office if you don't. You can use feng shui colors to narrow your choices of color schemes. Make the entrance to your office a clutter-free zone. Remove any obstacles clients have in navigating into your office. If you work from your home, strive to create an official entrance. Place floor lamps or wall sconces on either side of the outside door. Add a plant on either side of the entrance door. 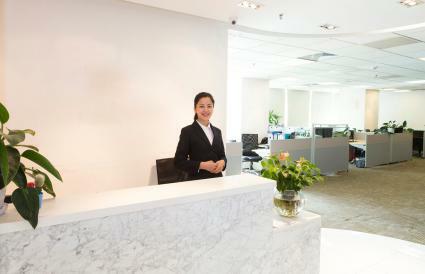 The different types of offices can present unique feng shui challenges. Where to place the desk is a common question and issue with many people. You can find specific feng shui desk placement guidelines to help you meet these challenges. Never ever sit with your back to the door. This is a big feng shui don't. The reason is you can't see what's coming up behind you. You could become the victim of office politics and backstabbing. If the configuration of your office is a cubicle and not something you can control, then place a mirror on your desk so it reflects what's directly behind you. This way you won't be startled or blindsighted by unexpected business turns. You want to take command of your room and need to place your desk so you can see everyone who enters. This is the position of power and gives you control. If you hold important business meetings in your office and need to win over clients, coworkers and your boss, make sure you take the North sector of your office during the meetings. North is the controlling direction and whenever opposed by any other direction; the North is said to always win. Once you know your personal kua number, take advantage of your best working direction. Without knowing this, you can still take control of your office by placing your desk diagonally across from the door. Further enhance your position by anchoring one end of the desk to a wall (meaning that end of your desk touches the wall). Don't sit with the door opening to your side since this creates poison arrows. Avoid sitting with your back to a window or your desk beneath a window looking out. The first doesn't support your work while the second position will allow too many distractions outside and keep you from your work. Always sit with a solid wall behind you for the best career support. How Do You Determine the Appropriate Feng Shui for an Office? Classical feng shui requires finding the facing direction, flying stars and the kua number of the building. This requires hiring a professional classical feng shui expert. While you are waiting for your feng shui analysis, use basic feng shui rules and principles to improve your office environment, business, and career. A neat office inspires confidence and states you're in control of your business. It also allows positive chi energy to enter and move about your office. If your budget doesn't allow for a cleaning crew, assign specific duties to various employees with a set schedule. Make each responsible for their area with a set of office housekeeping rules. It will pay big feng shui dividends to educate your employees on individual office housekeeping. 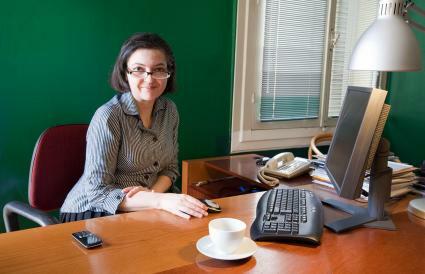 You want to emphasize decluttering and keeping cubicles, outer offices and other workspaces free of clutter. Most offices provide two types of lighting, overhead and task lighting. Most offices don't have much ambient lighting other than general overhead light fixtures. This can present a more sterile environment that isn't necessarily the best feng shui approach. If you want to add warmth to your office space, add a table lamp either on your desk or a credenza or console table. If you have room, set a floor lamp that is no taller than your cubicle walls to provide greater work light and warmer lighting. For an outer office, this lighting can soften office corners. A torchiere lamp provides reflective lighting that is appropriate for an outer office with lower ceilings. There are three main schools of feng shui. Two are traditional (classical) Chinese feng shui schools, while the third is widely embraced by the Western culture, especially the United States. Regardless which feng shui you practice, you can take advantage of basic principles to enhance your career and make your office inviting to chi energy for greater success in business. Practitioners use Compass Feng Shui in combination with Land and Form Feng Shui. A compass determines the facing and sitting directions of your office. Land and Form Feng Shui is concerned with the land and form features that surround your office. There are feng shui remedies for inauspicious surroundings, such as poison arrows. This form of feng shui is controversial among classic feng shui practitioners. Created by Tibetan Tantric Buddhist Monks, Black Hat Sect uses the bagua as a single tool without the guidance of a compass. The bagua is placed over the home or office layout the same way as a one-size fits all. Using basic feng shui principles helps you answer the question: How do you determine the appropriate feng shui for an office? When you apply feng shui to an office space, you'll feel the change immediately. The results of those changes are sometimes drastic while others are more subtle.